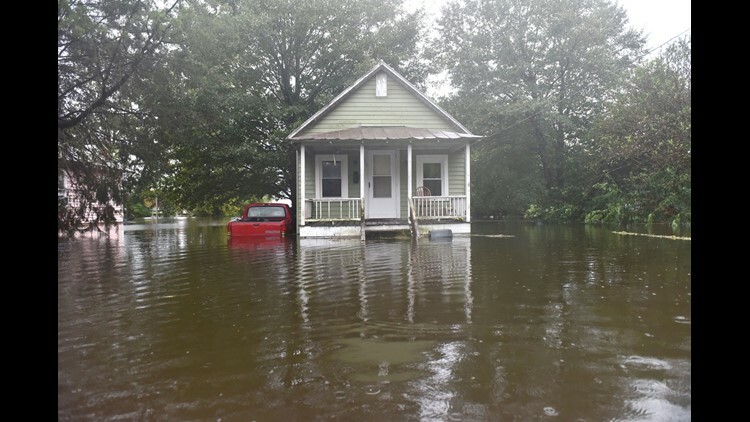 A woman speaks into a cellphone asking for help at her flooded residence in Lumberton, N.C., on Sept.15, 2018 in the wake of Hurricane Florence. Members of the Cajun Navy came to her rescue. Besides federal and state emergency crews, rescuers were being helped by volunteers from the "Cajun Navy", civilians equipped with light boats, canoes and air mattresses, who also turned up in Houston during Hurricane Harvey to carry out water rescues. 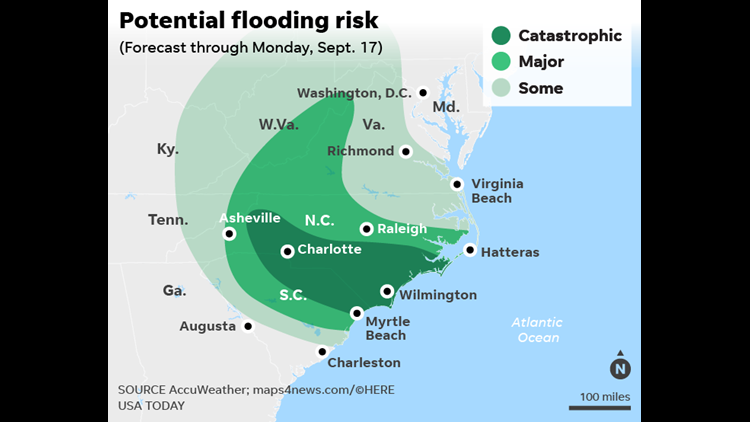 When floodwaters from now-Tropical Storm Florence finally subside and residents are allowed to return to their communities in North and South Carolina, the shift to recovery mode may seem overwhelming. But what you do in the days after a devastating storm can mean the difference between a relatively fast cleanup and an expensive months-long demolition nightmare. Experts advise these steps to help protect your safety and your wallet. "The first thing you need to do is take care of yourself. Make sure you're emotionally OK," said Elaina Sutley, assistant professor of structural engineering at The University of Kansas. "Only then should you start assessing any structural damage." What materials do I need? You should make sure you have knee-high rubber boots, long-sleeve clothing, a respirator, a flashlight, a camera and liquid bleach. Where do I start? Start by turning off any gas or power to prevent explosions or electrocution. Then begin drying out your home and addressing the structural damage such as a wall collapse or sinking ceilings. And remember: There may still be water left either in the basement or seeping from soaked furniture. "You need to open up windows and doors. Let things dry out," Sutley said. Fans and dehumidifiers can help speed up the drying process. While everything dries, which can take a few days, homeowners are encouraged to toss any food left in the home along with any absorbent material that has come in contact with water. Map of the Mid Atlantic shows area where the potential flood risks are minimal to catastrophic due to the hurricane rains. "If there was saltwater flooding, there might be corrosion, so get an electrician to look at that," said Jeffrey Schlegelmilch of the National Center for Disaster Preparedness at Columbia University. "Even if it's not salt water, things could still be dangerous. Fact-check with a professional before plugging anything in." What do I do with damaged items? Coastal areas that have experienced floods in the past will likely have protocols for picking up and handling debris such as drywall and large furniture. What can I keep? Family heirlooms, jewelry, photographs and other valuables can be air-dried and saved. Clean and disinfect them if they came in contact with floodwater. What should I avoid? Other than contaminated water flow, there could also be animals trapped in your home brought in by the floodwaters. "Areas like North Carolina have a lot of poisonous snakes. Floodwaters can bring these into your home. Look out for any critters that could be lurking in hidden areas," Schlegelmilch said. What happens if I wait? "If your home is just left to sit, it will continue to deteriorate, and it becomes even more of a health threat," Schlegelmilch said. Summer's heat and humidity make for prime conditions for mold, so act fast, Sutley said. 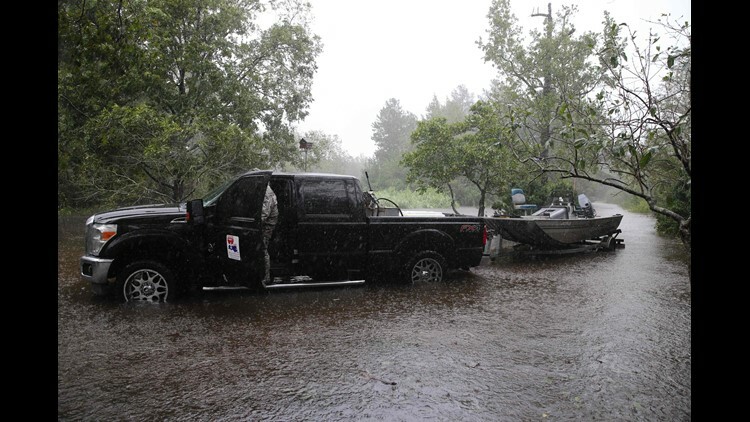 The Cajun Navy resue team patrols flood waters in Lumberton, N.C., on Sept. 15, 2018 in the wake of Hurricane Florence. The sooner homeowners file claims with an insurance agency or the Federal Emergency Management Agency (FEMA), the faster a resolution can be reached. However, traditional homeowner policies don't cover flooding. Only flood insurance policies reimburse families for water damage caused by flooding. "After Hurricane Matthew hit the southeastern United States, I worked on a project where we spoke to households and businesses about receiving assistance from their insurance or FEMA," Sutley said. "Most people who had insurance and filed a claim received help within 30 days. Most people who applied for FEMA had received it within a month." What do I need? Insurance documents, home deeds and your Social Security card can get you started on making an insurance claim. Photos and videos of the property both before and after the flood are also essential since recovery agencies will likely request proof of the damage. Where do I start? It's important to contact your insurance agency before you remove anything from your home. "Insurance companies sometimes want to send someone down to investigate before anything is taken out," Schlegelmilch said. After contacting your insurance company, work can begin. Homeowners are encouraged to remove any carpet or drywall that has come in contact with water before mold starts to form. "I would look to CDC guidance for which bleach to use. You don't want just to get surfaces to look clean, you want to make sure that there aren't any living mold spores," Schlegelmilch said. What if I don't have insurance? It's pretty common for people not to have flood insurance, no matter their income level. In coastal regions, it may be mandatory. But for those who live further inland, there are often local aid options. "Find out what types of public assistance is available in your area," Schlegelmilch said. "There are a lot of charities that pop up to help people get back in their homes. Some move people to the top of the list who are low income or have disabilities." To find out if you qualify for assistance or for more information, check FEMA's website disasterassistance.gov.